High torque and pneumatic stiffness combine together in the MASCOT Spring cylinder rotary actuator. These characteristics are designed into a lightweight, rugged and compact assembly, making the MASCOT rotary actuator the first choice for quarter turn applications. 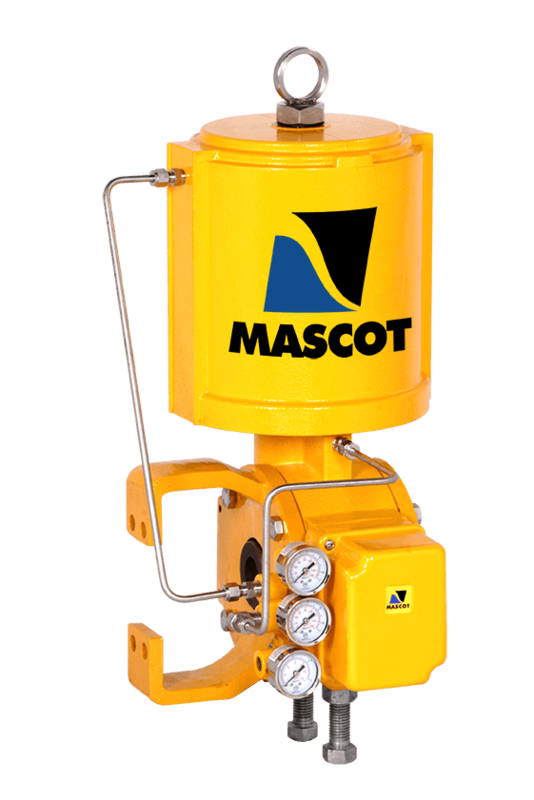 The MASCOT rotary actuator is created for operating the DiskFlo high performance butterfly valve, VFlo Segmented Ball Valve, EFlo Eccentric Plug Valve, QuickFlo Full Bore Ball Valve or other applications requiring precision in rotary motion. The MASCOT Rotary uses a rocking piston assembly for direct conversion of linear motion to rotary motion. The rocking piston assembly along with a splined shaft and lever eliminates any lost motion due to backlash. It is a compact and light weight actuator which has many interchangeable parts with the Linear Actuator hence reducing the spare part inventory and maintenance costs. Adjustable stroke stops prevent excessive rotation and reduce excessive torque on shaft. They also act as mechanical limit stops to mechanically limit the control valve’s travel for safety considerations. Fail-safe Spring •	Moves the actuator to failure position without the assistance of air pressure. Stroke Stops •	Adjustable stroke stops prevent excessive rotation and reduce excessive torque on shaft. •	Act as mechanical limit stops to mechanically limit the control valve’s travel for safety considerations.